On Friday, June 2, the Public and Affordable Housing Research Corporation (PAHRC) held its second annual PAHRC Report Forum at The Seaport Hotel and World Trade Center in Boston, Massachusetts. Community development experts gathered to celebrate the launch of the 2017 PAHRC Report: How Sustainable Communities Create Resilient People, to discuss the evidence, and provide suggestions for making communities more sustainable with a focus on lifting families out of poverty. The annual PAHRC Report is a comprehensive source for research and statistics on assisted housing. Its purpose is to foster a better understanding of the need for housing assistance and how this assistance helps meet the needs of low-income families and their communities. Following a different theme each year, the PAHRC Report provides data on the supply of housing assistance, persons receiving assistance, and the impacts assistance has on recipients and communities. A new panel for Session Two: How Affordable Housing Can Build Resilient People and Places took the stage and included local experts Ruthie Liberman, Trevor Samios, John Lindamood, and Eugene Barros. At a micro-level, this panel addressed the challenges that many low-income individuals face in seeking affordable housing and the critical role of housing in building resiliency against poverty. The Panelists shared how their organizations are addressing these issues and helping families make long term transitions out of poverty, as well as provided suggestions about how communities can approach sustainability, thinking first about helping their low-income neighbors reach their goals. Each of the panelists shared major lessons learned and the consensus shared is the need to recognize that each person is unique and should be treated independently from other residents. Additionally, it is important to work with those in housing to help them achieve positive economic mobility through support, coaching, and partnerships. 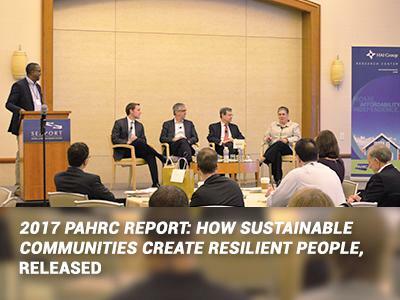 Click to read the 2017 PAHRC Report: How Sustainable Communities Create Resilient People.